Six Days in Fallujah might be down, but it's not yet out, with developer Atomic Games telling Kotaku to expect to a statement soon regarding the fate of the controversial shooter. While Konami may have dropped its plans to publish the "game-amentary" in the face of public backlash, it's quite unlikely that developer Atomic Games and its sister company Destineer will do the same. 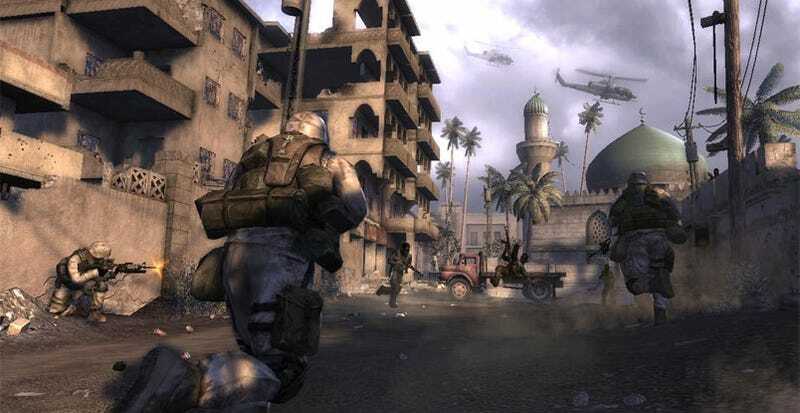 Despite the emails, phone calls, and bad press generated by the video game adaptation of the Second Battle of Fallujah, Destineer has been behind the title since 2005, and that's not the sort of time investment you throw away lightly. According to a timeline published over at One Last Continue, Destineer originally filed for the word mark "Six Days in Fallujah" on February 4th, 2005 - less than two months after the actual battle ended. Later that year the company purchased Atomic Games, who were then working on Close Combat: Red Phoenix, and would eventually be revealed as the developer behind Six Days. In November of 2005 the trademark for Six Days in Fallujah was published for opposition, a step in the trade marking process which allows other entities to contend the application in case it conflicts with another product. Then in January of this year Destineer filed for the trademark again, as their original filing expired this February and they wouldn't have anything to show for it until April. Then came April, when Konami proudly announced Six Days in Fallujah, sparking controversy among the general public and military veterans as well. The uproar grew even louder when it was revealed that insurgents that fought against U.S. Marines during the battle were consulted and likely compensated for their work on the game. Konami declined to comment on the nature of their business arrangement with said insurgents, but the fact that the term "business arrangements" was used in their response tends to indicate that compensation was provided for the insurgents work. UPDATE: After posting this story, Atomic Games contacted us with a message from president Peter Tamte, informing us that the insurgents were in no way compensated for their contributions to the development of Six Days in Fallujah. Amidst a storm of angry emails and phone calls, Konami finally decided to pull the plug on Six Days in Fallujah today, a day before the second trademark filing is published for opposition. We contacted Konami for comment, but as of this writing have yet to receive a response. Does this mark the end of the Six Days saga? Not quite. Calls from Kotaku to Atomic Games were fielded by public relations officials from sister company Destineer, informing us that an official statement regarding the fate of the game would be issued within the next day or so. Destineer's handling of calls about the game had us thinking that perhaps the company plans on publishing the title themselves, though we've just received word from Destineer that no plans of that nature have been discussed. We'll know for sure shortly, but we're relatively certain this isn't the last we've heard on Atomic Games' Six Days in Fallujah.